Who Do You Think You Were Kidding, Dr Beeching? Fifty years on from the Beeching Report, it is still hard to get an objective analysis of its recommendations and the impact of those that were followed. The Beeching Report recommended taking an axe to about a third of the network—5,000 miles of track, including hundreds of branch lines, 2,363 stations and tens of thousands of jobs. At the time, this was seen as draconian and, even now, it looks very like medieval medicine which sought to drain poisonous ‘humours’ from the blood, often with the aid of leeches. His bland bureaucrat demeanour did much to incense people at the time and the scale of his proposed cuts seems brutal until you compare what has since happened to the rest of heavy industry and its infrastructure, including steel, coal, cars, shipbuilding and other segments that were seen as permanent parts of the economy fifty years ago. Before he was drafted in to take drastic action, Britain’s railways were decades into decline. From the profitable pioneering days of the late 1800’s, railway companies had pretty much lost the plot in Edwardian time, building branch lines for which no serious business case could be made and entrenching much of the inefficiency that would eventually (and still?) compromise profitability. overall strategy was driven by political more than commercial concerns. To be sure, business sophistication and business school graduates were both rarer in 1960 than half a century later. But Drucker had written several books, operational research and systems analysis were recognised disciplines and management-driven success stories like IBM, ITT, General Motors, etc were slickly profitable behomoths. Dealing with BR’s problems would be tricky but not beyond the wit of man. Instead, the decade since nationalisation having been spent largely treading water and losing money through a creaking network fit for the Victorian age meant that the Tory government of the time wanted a sword of Damocles to cut a swift solution. The 1955 Modernisation Plan promised expenditure of over £1,240 million; steam locomotives would be replaced with diesel or electric, traffic levels would increase and the system was predicted to be back in profit by 1962. But losses mounted and, by 1961, were running at £300,000 a day. Some overdue rationalisation had been done since nationalisation in 1948; 3,000 miles (4,800 km) of line had been closed; railway staff numbers had fallen 26% from 648,000 to 474,000; the number of goods wagons fell from 1,200,000 to 848,000. Clearly, more needed to be done. But, instead of a strategic review of railways and their future role and a systematic reshaping of them to more closely achieve that, The Reshaping of British Railways took a blunt, simplistic approach that would have been a credit to a Micawber-era industrial baron. Hull to York via Beverley recouped 80% of costs but duplicated a similar service. Freight was given a similar thorough going-over, with the bulk of the hopelessly inefficient goods yards at almost every station to be closed now that road freight was not just challenging but had won the non-bulk element of the business. But where Beeching did us all a disservice was three-fold: 1) he thought because some cuts were obviously necessary and good, more cuts must be better; 2) he saw the rise of the car and lorry but didn’t see the congestion they would cause; 3) he believed that there was a freight business below trainload size. Almost all the fuss and opprobrium revolve around the first point. Indeed, his solution would have meant no railways anywhere in the Highlands, in Wales or even between Edinburgh and Newcastle (currently the best UK train service). Some 6,000 rural miles of the 18,000 mile network and 2,363 stations were to close. And, during the 1960’s much of this came to happen, culminating in the closure of the Waverley Line in 1969. This left the Scottish Borders with no rail and no stations and was mightily opposed at the time. The problem was that, politically, few of the closures went quietly and the news was full of protests around the country as line after line, station after station “had their services withdrawn” (in the euphemism of the time). Much of the residual venom is a folk memory of the event and its associated anger and frustration. In modern terms, the media handling was poor and the debate often focussed on another dead parrot of a station. Sterling examples of this Iron Horse sub-species of Norwegian Blue were in my own backyard. At thirteen, trainspotting on the ECML at East Fortune, our thrills at Gresley A4s or the new Deltics blasting though with the London express were punctuated by the Berwick stopping train squealing its five motley carriages to a halt for no-one to get on and no-one to get off. Even a thirteen-year-old could see this was no way to run a railway. But nobody seems to have done proper homework on a systems level. In a rush to get as much closed as they could, BR calculated costs by track-mile used. As a result, in 1970 they were all set to close the North Berwick service (currently among ScotRail’s most profitable). Some sharp analysis by many of the professionals who used the line to get to work proved that the incremental costs to run it (80% of its distance, it shares the ECML) were low enough to make it profitable. It was one of the first reversals of his plans that has restored a small portion of the rail network in the last half-century. No only that, when the ECML was electrified in 1991, the case to continue that on the 5-mile single-track spur to North Berwick was overwhelming and helps explain the solid 2-way traffic (commuters & shoppers inbound, students & tourists outbound) that make it ScotRail’s nice-little-earner. What Beeching did NOT do was proper cost/benefit analysis that included social priorities, future opportunity and (especially) the clogging up of the road new that would throw appreciable traffic back onto rail. Take the £295m (aye—that’ll be right!) cost of reinstating less than half the Waverley line. That is equivalent to a £6.5m annual subsidy if the line had been kept open since 1969 and it was already bringing in £2.2m in revenue (2012 prices) at the time of closure. Even averaging over the 44 years, that’s £4.3m each year to have run Edinburgh-Carlisle trains all that time and still be ahead financially. And yet two components for the first (Leuchars-St Andrews and Thornton-Leven) are both now under consideration for re-opening and pat of the second (Stirling-Alloa) has been reinstated. In 1963, both St Andrews and Alloa were taking in over £1/2m each (today’s prices) and Leven was taking half of that. All three were babies thrown out with the Beeching bathwater. Reinstatement of the Alloa line cost £57m. Perfoming a similar calculation to the Waverley one above, that means an average of almost £1m annual subsidy would have more than covered the costs of sustaining the Alloa link. In 1963 it would have been difficult to be clairvoyant about how rail could be turned around as a business of the next 50 years. But several hard-nosed business cases could have been made, as shown above. It was the less hard-nosed arguments of social needs and tourism that kept the Highland lines open and are now such an asset. Most of those that did close in that sparse region should have closed, although the spectacular Dunblane-Crianlarich via Callander and Lochearnhead would have been a tourist favourite and add hugely to rail tour options on the West Highland Line. So, should Beeching be pilloried or praised? A clear case can be made for the former. Anyone with a calculator could have done the simplistic butcher job he did. The relative density of population furth of Scotland and the drastic change in our economy from West coast grime to East coast oil meant that we were proportionally hit harder: growth areas like Fraserburgh and Peterhead were sliced off the rail net, yet their line might have been humming with both passenger and freight within a decade. Who knows how much more effective a system could have been electrified and modernised with the same money we’re now spending in reversing the short-sighted, bean-counter attitude with which Dr Beeching approached his historic task. 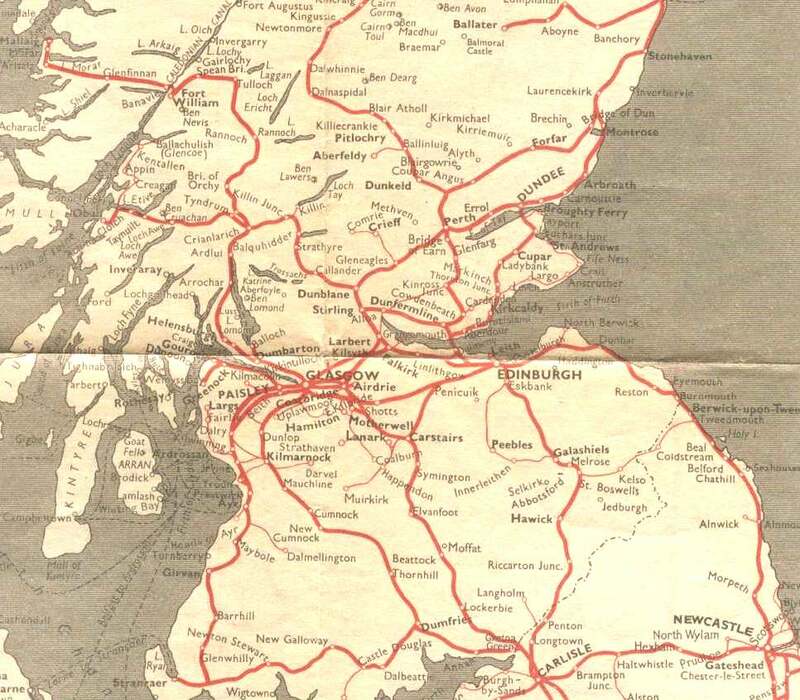 Glasgow-Aberdeen in under two hours; Glasgow-Edinburgh in under 30 minutes; tourists flocking to St Andrews or Melrose or the Trossachs by train, maybe by a steam train called “Dr Beeching” in his dishonour—because he never seemed to understand Scots humour any more than our rail needs. This entry was posted in Commerce, Transport and tagged Dr Beeching; rail network; service cuts. Bookmark the permalink. 1 Response to Who Do You Think You Were Kidding, Dr Beeching?